A new enzyme technology has the potential to reduce ethanol production costs and is being used in a new integrated cellulose and starch ethanol commercial demonstration facility in Montana. AE Biofuels employs technology that will allow ethanol production to be more cost competitive, using low cost enzymes to convert low-value cellulosic waste materials-such as corn stalks-into ethanol. Although oil prices have eased off historic highs that at one point this past summer approached a stunning $150 a barrel, the U.S. alternative fuel industry is continuing to push ahead with innovations in a number of areas, in efforts to make the country less dependent on foreign sources of energy. Ethanol production in particular could become more cost competitive with the arrival of a proven new enzyme technology to launch the fermentation process needed to produce ethanol from either starch or cellulosic feedstocks. The icing on the cake is that this technology will allow companies to eliminate the high energy cooking and cooling process for a conventional ethanol plant or combine starch and cheaper cellulosic feedstocks at the front end of the process, thus reducing the overall cost of ethanol production. According to process co-developer Bob Kearns, the use of this no-cook technology can reduce operating costs by 26.5 cents per gallon of ethanol produced. Integrating the cellulose technology at the front end of an existing ethanol plant has the potential to reduce operating costs by as much as 42 cents per gallon of ethanol produced. It can also be adapted to existing facilities at practically no capital expense. The patent-pending ambient temperature cellulose and starch hydrolysis (ATCSH) enzyme technology that Kearns and co-developer Cliff Bradley developed is now being commercialized by a globally integrated biofuels company, AE Biofuels Inc. It owns or has optioned five permitted ethanol plants in the United States and its Universal Biofuels subsidiary owns a 50 million-gallon biodiesel plant in India. The company is also planning a 75 million-gallon-per-year biodiesel plant in Argentina. The opening of AE Biofuels' integrated cellulose and starch ethanol commercial demonstration facility in Butte, Montana (top, right). 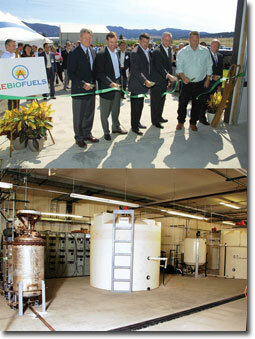 It is said to be the first integrated cellulose and starch ethanol demonstration facility in the United States. To introduce and demonstrate this technology to industry, AE Biofuels has entered into a joint venture with Kearns and Bradley called Energy Enzymes. Kearns says he and his partner had been working to find ways to develop less expensive enzymes for cellulose conversion since the mid-1980s. The two main drivers behind their research have been developing enzyme technology that will allow ethanol producers to be more cost competitive, and also finding ways to produce low cost enzymes to convert low-value cellulosic waste materials such as wheat straw, rice straw, and corn stalks into ethanol. However, as interest in producing ethanol waned in the 1980s, they took their enzyme research and development program in a different direction. Their work in enzyme technology related to ethanol production twigged the interest of AE Biofuels. "AE Biofuels found us," Kearns says, which led to the joint venture and the recent construction of a 9,000 square-foot integrated cellulose and starch ethanol commercial demonstration facility in Butte, Montana. It is using ATCSH technology on multiple feedstocks, including switch grass, grass seed straw, small grain straw, and corn stover in combination with a variety of traditional starch and sugar sources. In an attempt to fast track commercialization of this technology, AE Biofuels is aggressively evaluating sites that would be suitable for large-scale commercial production of ethanol using this process. Kearns is a strong believer in pursuing the conversion of existing facilities to the ATCSH process as a first step in commercializing cellulosic ethanol. "The easiest way to commercialize this technology is to integrate it into existing plants, and I think it offers a lot of benefits to everyone," he says. 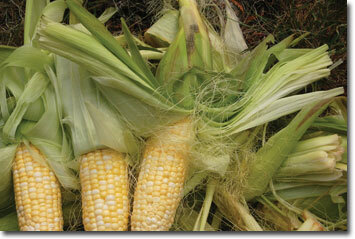 The concept is to replace up to 35 percent of starch-based corn with corn stover. One of the immediate benefits is that it provides the grower with another cash crop. The ethanol plant also benefits from a 42 cent per gallon operating cost reduction. Also, the amount of feedstock from a potential food source going into ethanol production is reduced, and lastly, producers are replacing corn, which is subject to the ebb and flow of global demand, with an inexpensive non-food, cellulosic replacement. In addition to all this, the capital costs of integrating cellulose are minimal. All the existing equipment is used, and some capital is required for cellulosic feedstock storage and grinding, and it may require the addition of one or two new fermentation tanks depending on the design of the existing plant. By integrating starch and cellulosic feedstocks, companies also overcome the low alcohol production challenge of using cellulosic sources exclusively to produce ethanol. By using the ATCSH enzyme approach, it is possible to maintain distillation of about 12 percent alcohol by integrating it with a partial starch feedstock. "In an integrated ethanol production process, we use our cellulose enzymes and make a cellulosic beer," says Kearns. "Then we add raw starch and our starch enzyme to the beer, so we are able to increase our alcohol concentration from a nominal three to five percent up to 12 percent. If you tried to do this with conventional enzymes, the 'cooking' step would boil off all the beer from the cellulosic step." Bradley says there are significant differences between this enzyme production technology and the way that enzymes are traditionally manufactured. He describes it as a different fermentation technique. Conventional technology to produce enzymes is to put a fungus in a tank of nutrient media in a liquid culture, and the fungus produces the enzyme. The enzyme is then purified out of the liquid. There are issues with that approach. "Fungus don't normally live in tanks of water," he says. "They live in relatively dry environments and they are also very aerobic. They need air." The ATCSH approach is something called solid substrate culture, also referred to as solid substrate fermentation. "Instead of a tank of liquid, the fungus is actually grown in a packed bed in a solid substrate," says Bradley. "That's much closer to the natural conditions that you find fungus. "If you grow them in solid culture, they are aerated from atmospheric air rather than dissolved oxygen in a liquid, so you get much better aeration and you can grow them on much more complex material." The major breakthrough as far as ethanol production is concerned is the variety of enzymes that are produced in this way. The result is actually a whole different mixture of enzymes that are capable of breaking down complicated, real world cellulosic materials, says Bradley. "We can get everything we need in one culture and one preparation," he says. "The liquid culture people have to mix two or three enzymes together from different cultures to get the same mixture. So, that's a major part of our economics." The Kearns/Bradley team has developed two different enzyme preparations, one for cellulosic material and one for starch-based material. The starch enzymes use different fungi and different growth substrates, but it is still the solid substrate culture method. These two types of enzymes can be combined so that both cellulosic and starch-based materials can be integrated at the plant infeed, thus yielding the model that presents the most favorable first step to commercializing this technology. The advantage of using the starch enzyme as a standalone product is that it effectively eliminates the need for the cooking and cooling step that triggers the fermentation process when dealing with starch-based inputs, as these enzymes are capable of launching the fermentation process at the prevailing atmospheric temperature. There are two steps in the conventional ethanol production process where heat is required-the cooking/cooling process and the distillation process. As considerably more heat is required in the cooking/cooling process, converting to enzyme use on the front end eliminates the most heat intensive step. Water consumption also drops from about three gallons of water per gallon of ethanol produced to two gallons. While there are significant energy savings when using the starch enzyme, the energy savings are not nearly as great when using the cellulosic enzyme as a standalone because a delignification step is still required when dealing with cellulosic inputs and all use some form of heat. "One of the advantages of our cellulosic enzyme is that it allows you to use a less expensive caustic delignification step rather than an expensive acid step, and at a lower temperature," says Kearns. "Also, because you operate at a lower temperature, you produce fewer fermentation inhibitors that are associated with severe process conditions." In the integrated model, delignification of the cellulosic inputs are still required, but because no heating or cooling of the starch-based inputs is required, the cooker can now be used as a delignification vessel, thereby minimizing capital costs for conversion. In addition to developing an economic model showing how existing starch-based ethanol plants can realize significant savings by integrating up to 35 percent usage of cellulosic feedstock, AE Biofuels has also developed a model for a standalone cellulosic plant. In that case, "it would appear that you'd probably reach a breakeven operation at about 10 million gallons of annual ethanol production," says Kearns. "Ideally, if you want to build a commercial plant, the minimum size you'd probably want to build would be a 20 million-gallon-per-year facility." Access to a reliable feedstock is obviously one of the critical pre-existing conditions for a plant to be viable. Kearns believes that the model developed by AE Biofuels provides a realistic estimate because it takes the cost of transporting raw materials within a 60-mile radius of the plant and the need for delignification into consideration. "When someone says they can produce cellulosic ethanol for $1 per gallon, I'm skeptical," says Kearns, considering that their model indicates the cost of simply purchasing and delivering the feedstock to the plant within a 60-mile radius is already $.76 per gallon. Factor in the Department of Energy estimates of $.33 per gallon to produce the enzymes, and that's $1.06 per gallon, and nothing has happened yet on the production end. Kearns says the initial capital costs of building a cellulosic plant using this technology are more expensive than a conventional starch-based ethanol plant primarily because more fermentation capacity is required to achieve the same throughput, plus about twice as much distillation capacity is required as cellulosic feedstocks produce a lower alcohol concentration in the fermentation beer. That's why the integration model makes more sense as a first step because of the minimal capital costs required to make the conversion to using cellulosic feedstocks like corn stover as a replacement feedstock for commodities like corn.